Sjögren’s is another autoimmune disease that affects those who have lupus, or similar illnesses like rheumatoid arthritis. If you have an autoimmune disease, then you will know what I mean when I say that one autoimmune disease will bring many more of its autoimmune friends along to the party. Sjögren’s is just one of many potential 'friends'. It is pronounced like Show-grens, and is another autoimmune condition; this time the immune system attacks the fluid-secreting glands in the body e.g. the tear and saliva glands. 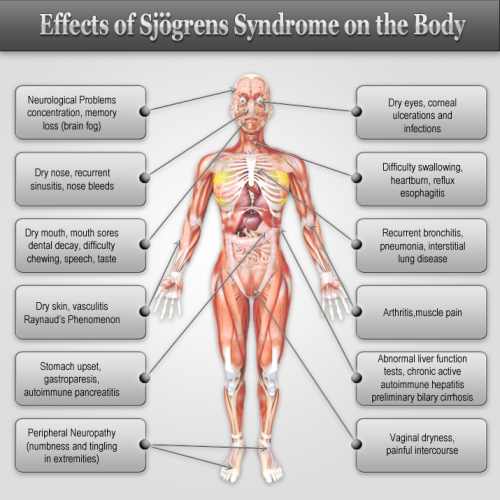 Primary Sjögren’s, which does not occur with any other illnesses. This form is more likely to be more severe than the secondary version. Secondary Sjögren’s, which develops in association with other autoimmune disorders like rheumatoid arthritis, lupus and other autoimmune conditions. Dysphagia (difficulty swallowing) and food getting ‘stuck’ in your mouth, throat and oesophagus due to the dryness caused by Sjogren’s. ‘Cotton-mouth’ i.e. very dry mouth, especially in the morning. ANAs are a group of antibodies that react against normal components of a cell nucleus. About 70% of Sjögren’s patients have a positive ANA test result. This antibody test is indicative of a most often performed for the diagnosis of rheumatoid arthritis (RA) but is positive in many rheumatic diseases. In Sjögren’s patients, 60-70% have a positive RF. These are the marker antibodies for Sjögren’s. Seventy percent of Sjögren’s patients are positive for SS-A and 40% are positive for SS-B (these may also found in lupus patients). This test measures inflammation. An elevated ESR indicates the presence of an inflammatory disorder, including Sjögren’s. These two tests are usually carried out by an ophthalmologist. “A rheumatologist diagnosed my SS using a Schirmer’s Test. He placed a small, thin paper under my lower eyelid to check the dryness of the eyes. It was very simple and quick and done in his office and scored to tell the amount of dryness in the eye. The Sjögren’s Foundation describes another eye test that may be used, the "Rose Bengal and Lissamine Green" test. "Eyedrops containing dyes that an eye care specialist uses to examine the surface of the eye for dry spots." Salivary Flow, which measures the amount of saliva produced over a certain period of time. Salivary scintigraphy, a nuclear medicine test that measures salivary gland function. Artificial tears that come in different thicknesses. You may have to try a few to find the right one. Eye ointments. These are thicker than artificial tears. They protect the eyes and keep them wet for several hours. They can blur your vision, so you may want to use them while you sleep. Medicines to reduce inflammation in the eye. A chemical that wets the surface of the eye and keeps the natural tears from drying out so fast. It comes in a small pellet that you put in your lower eyelid. When you add eye drops, the pellet melts. This forms a film over your own tears and traps the moisture. Surgery to shut the tear ducts that drain tears from the eye. Sipping water or a sugar-free drink often to wet your mouth. Using oil or petroleum-based lip balm or lipstick to help dry, cracked lips feel better. Using a saliva substitute prescribed by a doctor to make the mouth feel wet. Using medicine to help your mouth make more saliva. April is Sjögren’s Awareness Month. Check out the World According to Lupus on Facebook for more information and awareness campaigns. I hope that you have found this information piece helpful. If you have any questions, please leave a comment and I will get back to you as soon as I can. Thank you for reading!